First came two stalls packed to the top with everything we need to train and race 10 horses for six weeks. Water buckets, feed buckets, saddles, bridles, rugs – oh, the rugs. Winter coats for cold nights, lighter polars for sunny days, exercise sheets, rain sheets, presentations sheets, saddle cloths…it was endless. And of course, the hay steamer had to go. And the wheelbarrow. Forks, brooms, bandages….and then, of course the horses. After nearly two hours of loading, we were exhausted and then we had to get US down. Two by train, one by car, baggage wherever it would fit. 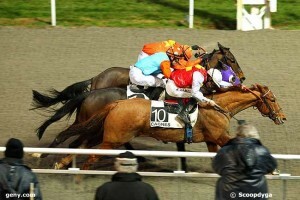 But then Cagnes works its magic. We arrived to full sun, palm trees, an azure sea, mimosa about to bloom – a fabulous place to work. By the time the horses were tucked in their new boxes, our tack and feed rooms set up and we were installed in the sun at the cantine around a great lunch and a bottle of rosé any doubts about the trip were far behind us. The weather cooperated this year, unlike last year, when we were pelted with endless days of rain. The horses, for the most part, cooperated, too. They did what they were supposed to do. They soaked up the sun, ate like they were on vacation and worked like champions. We won three races and placed six times, for total earnings topping 65,000 euros and our best meeting so far in the five years I’ve been making the trek. There were some disappointments, of course. Barbe a Box never ran a decent race and his owner got fed up and moved him to another trainer. Fair enough, but the horse needs gelding, and until that happens, I’m not looking for a miracle on the racetrack. We had to stop with Pahlavan because his wobbler’s syndrome made him too dangerous to continue. Gorki Park told us yet again that while he is fine with sun, he doesn’t like the sand. And Risk Well Taken is still fighting with us about whether she wants to be a racehorse. The jury’s still out on that one. But the others picked up the slack. Ray of Hope won his comeback race and then won again, just to make sure he’d keep his place in the first string. Not to be outdone, King Driver came up with the goods, and Moughjim, Eternal Gift and Impulsive American all took home checks. When the season ended, we didn’t want to come home (not least because it meant packing up everything we’d brought down). But it wasn’t just the wonderful weather that was making us drag our heels. Last year, when we got home almost everybody got sick, horses and humans alike. It took us six months (and a hay steamer) to get the ship righted. Reality and the racing calendar meant that we had to go home, so we did. But what a difference a little sun makes. This year, everybody got home same and healthy, and we saw the proof yesterday at St. Cloud: we scored our first double when King Driver and Gorki Park both won their races, taking advantage of the fitness they build in Cagnes. Moughjim also was in the money again in Lyon. Only Ray of Hope told us he really didn’t want to leave Cagnes. He was never traveling when he ran in Deauville last week, but the fiber track there is a considerably harder surface than the track in Cagnes, and he never found his action. We’ll try him on a yielding turf course and he’ll find his winning form again. We’ve had five winners so far this year, which puts us ahead of all of last year, and we’re just getting started. Spring is finally coming to Paris, and we’re ready for la vie en rose! When T.S. Eliot penned “April is the cruelest month,” he obviously had forgotten about November. But then again, he probably wasn’t involved with racehorses. For those of us who are, November has to be the most miserable time of the year. The days are so short that you start work in the dark and you finish in the dark. Thankfully, this year hasn’t been nearly as cold and snowy as last year, but it has featured bone-chilling high humidity. A thick fog has blanketed Maisons-Laffitte for the past few mornings, and it gets heavier in the hour after sunrise, already the coldest of the day. The horses don’t appreciate it much, either. They change their coats, pushing out winter wool, which we then have to clip off so they can work and sweat without catching cold. The heavy rugs have come out, but get alternated with the lighter polar fleeces during the day, because the winter rugs are too hot in the afternoon. Changing their clothes three times a day adds to the work load, and wiping all the runny noses and seeing to the coughs and sneezes are keeping us running, too. It’s the time of year when we need to decide who should push through a winter campaign and who needs a break. 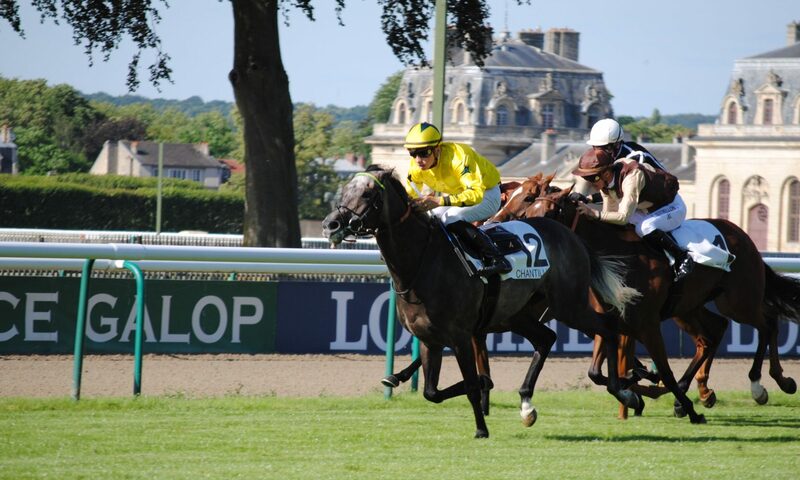 The turf racing is almost over, and the all-weather races in Deauville and Cagnes-sur-Mer are ahead. We’re counting the days until Dec. 21, when we start to add back those precious minutes of sunlight that make such a huge difference. By then, too, the horses will have adjusted to winter. 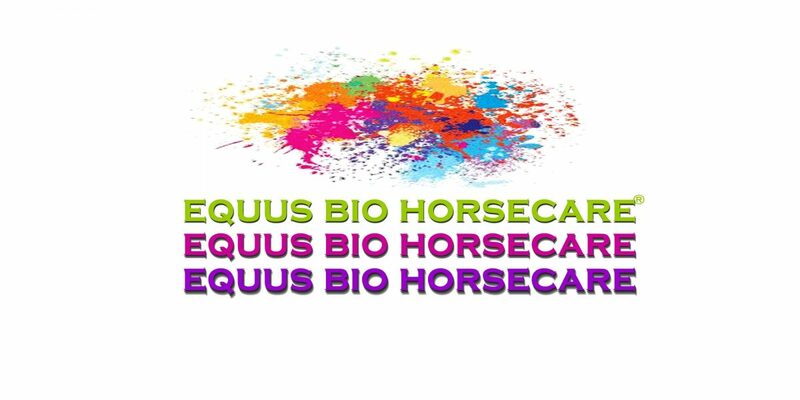 The coughs and niggling health problems that come with the change of season should be behind us – to some extent, it seems we’ve already turned that page, because most of the horses seem to be coming up in form. All that Vitamin C and echinacea extract has paid off. Satwa Sunrise has started galloping without the aid of Lasix, and seems to be completely fine. We haven’t done head-to-head work with her yet, but will start that next week, and she should run in two weeks (or at least she has an entry – we’ll have to see if she gets in. Magical Flower seems to be recovered from her brush with a cold, and even Triple Tonic seems back in form, except that she popped a splint on her near fore and will have to have an easy week to let it set. Deep Ocean is a lovely horse, and the infiltration and Tildren treatment seem to have made him pretty comfortable. He had a gallop yesterday that was quite impressive, and I’m looking forward to seeing him race in December. He has to switch boxes and go to a bed of shavings, though, because he has threatened to colic twice in the past week after trying to eat his entire straw mattress. Little Milly (Surrey Storm) is giving us no trouble at all, and seems to be balancing up a bit better. Hard Way is training up so well I’ve had to cut his feed back because I can’t hold onto him any more. He was supposed to be spending the winter as essentially the stable pony, and he’s only eating pony food, but he thinks he’s ready for Longchamp. I had forgotten what a magnificent stride he has – even going slow he opens up huge distances from the others. Anyway, we’ll try to keep him turned down to simmer for the moment. The enigma has been King Driver, who just doesn’t seem to have a great immune system. He ran two nice races, but then we had to give him a flu shot, after which he promptly got a fever and a cough. Just when I’m ready to pick up the phone to call the vet to come and geld him, though, he seems to stage a miraculous recovery. He’s not quite 100 percent yet, but he’s fighting hard to get there. Pretty much everybody can race in December, I think, and then we need to decide who goes to Cagnes. Strictly Rhythm will come back into training in December to get ready to go down south, and Sunrise, Magic and Milly will probably also go. Deep Ocean can’t because he can only run left-handed (Cagnes runs right), but King and Triple can go if they are healthy. I have six boxes, so the final roster will wait awhile to be determined. Meanwhile, dreaming of Cote d’Azur sun will get us through November, which, apologies to T.S. Eliot, really is the cruelest month. …is paved with good intentions. That certainly was in evidence this past week, when a number of attempts at good deeds were fraught with unintended consequences. Where to start? How about the story of George. I sold him to an organization called Ecurie Second Chance, which buys out-of-training racehorses, reschools them and then sells them on as riding horses. Sometimes, with the owner’s consent, they are placed again for racing. When I sold George, for just 500 euros, which is the going rate for retired racehorses, I said I wasn’t opposed to him racing again if a small permit-holder was found and if the horse had a much-needed break. George is sound, nice and could race next year in easier venues than around Paris. A week later, the man who bought the horse called me and said he had two possibilities that both involved racing: One in Martinique, and one in France, but for either one he’d have to move on immediately. Needless to say I wasn’t pleased with either choice, but in all fairness I had sold the horse, so I had very little say in the matter. Between a rock and a hard place, I said I prefer he stay in France. That week, he showed up declared in training with a public trainer with a yard of 25 horses, and a week after that he was entered in a sprint up in Le Croisé-Laroche, a dismal track near Lille that I would avoid racing at at all costs. George would have to endure a seven-hour truck ride each way to get from his new trainer’s base to race and back, not to mention it was a race completely unsuited for him even if he WAS in shape. He raced, and needless to say he finished last, poor kid. The next day I saw he was entered in a race at Amiens seven days later. That was when Kay, my American owner who had leased George while he was with me, and I took action. Long story short, we bought the horse back, and we’ve found a new home for him that will not include racing. …and the names are changed to protect the – well, not the innocent, really, but…a horse, let’s call her Sadie, was injured in a race at the end of September. The nature of the problem meant that she had to be on box rest for a few weeks, but she was a very nice-natured filly and would make an excellent riding horse; the injury wasn’t limiting in that sense. I immediately started looking for a home for her, but obviously it is hard to place a lame horse, even with good potential. So I was forced to hang onto her for longer than I wanted, and certainly far longer than the owner wanted, but I did eventually find a very nice home for her at the end of October. This meant the owner was being billed for the horse a month longer than he wanted to be. He paid, along with a registered letter saying how furious he was with my “extortionary” price of 30 euros a day for a horse out of training. I understand his frustration, but despite all, I applaud him for paying his bill and not ordering the horse sent to slaughter, which I suppose he could have done (for the record, I wouldn’t have done it, even if it meant paying the horse’s keep myself). In any case, this story ends well: I just got a photo from the new owner, and he is thrilled with her. And for the record, the price I charge is far from extortionary; there is no profit margin there. Hay and straw prices have skyrocketed this year, and while the horse wasn’t ridden out, she was kept in a clean box, brushed and fed daily. The standard of care doesn’t change when the horse can no longer race. We soldier on. Going into winter is the worst time of year in the horse business. Magic picked up the dreaded cough right before her race on Monday, and I nearly scratched but didn’t and should have, probably. In any case, the distance of 2,500 meters seems just a bit too long on heavy ground, and I’ll look for something shorter for her once we clear up the cough. King ran a great second race at St. Cloud last week. He’s learning his lessons well and I want to get a couple of more races in this year, but we had to give him a flu shot this week, and of course, he’s had a reaction to it. I’m hoping it’s a brief setback, but don’t know yet. The new fillies from Newmarket are doing well, and Triple Tonic, back from her convalescence in Normandy, is jumping out of her skin. It’s great to have Hard Way back. He seems better than ever and hasn’t lost a step – if you don’t hang onto him in the morning he’ll be off like a shot. 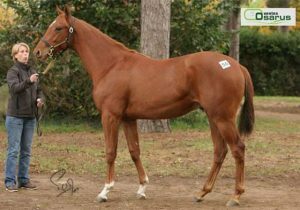 And we have a new colt, Deep Ocean, who came to us from Marseille. He can only race right-handed because of stringhalt in his left hock, which makes him a challenge, but he’s a lovely horse who clearly always tries his best (he’s had a win and six places this year). All of them are being aimed at some winter racing on the fibersand in Deauville and later in Cagnes (except for Deep, who can’t go to Cagnes because it is left-handed). Already, November this year has been paradise compared with what we had to put up with last year. I don’t know how long we can escape the freezing temperatures, but I’m treasuring every day I don’t need to put ten layers and gloves! King debuts, and Hard Way’s home! Two big events this past week: King Driver finally is officially a racehorse, and Hard Way has come home. King debuted Thursday on the fibersand in Deauville. I sent him there not because I thought he would be particularly adapted to the surface, but more because the big Chantilly trainers tend not to send their very best on the sand for a debut. I also realized the race 1,500-meter race would probably be on the short side for him, but he needed to learn what it was all about. I was right on both counts. There were a couple of decent horses from Chantilly, but I doubt next year’s Derby winner was among them. And King figured out he needed to stretch out and accelerate only about 50 meters from the finish, which was, of course, far too late. But he learned some very good lessons, and I’m very pleased with his debut. We drew our least-favorite far outside post, No. 15, which left us sort of hanging out to dry, but since all the horses were debuting, they all ran in a wide pack rather than arranging themselves in the usual ordered peleton. King was with the leaders until they started moving away from him at the turn, at which point he was wondering where they were going in such a hurry. Now that he understands a bit better, I suspect his next race will be quite a bit more interesting. And that should probably be on Nov. 3 at St. Cloud, a mile on the turf. The surface and distance will suit him better, although he’ll eventually need to stretch out closer to 2,000 meters. But he’s going to need a few races to learn the game, and there’s no need to push him too much. He is going to be a very useful horse if we do things right with him. Hard Way, meanwhile, has come out of retirement. For the moment, he’s sort of the stable pony, but when I had a hack through the woods with him today he certainly felt more like a racehorse than a trekking pony. He is bright-eyed and seems very happy to be back. We’ll see what he tells us he wants to do. Magical Flower ran her first handicap last week and finished only 7th, but she was carrying 59.5 kilos and the winner 53.5. Luckily, she’s now come down 1.5 kilos, so rated 30 we should be better placed next time out. She is a nice horse and will win somewhere between 2,500 and 3,000 meters. She’ll be entered in both on Nov. 4, and we’ll take whichever race we can get into; unfortunately by not being able to grab 5th last week, she is still “exclu” because she hasn’t passed 3,000 euros in earnings and will be the first eliminated. And we gave Rendition another shot yesterday in Pornichet, but the race confirmed what we pretty much knew: while her heart, head and upper body are in the game, her legs can’t keep up. So we’ll look for new horizons for her. Meanwhile, I’m getting ready to head off to Newmarket tomorrow for the annual fall Horses in Training sale. The catalog looks enticing, as always, so anyone needing a racehorse to run down in sunny Cagnes-sur-Mer this winter should speak up! Buy yourself an excuse for a weekend in Nice in January! George left the yard yesterday to start a new life with the aptly-named Ecurie Second Chance. He is sound and could race again, but most likely will be reschooled as a riding horse. He has such a wonderful personality and is very fun to ride, so I’m sure he will do well. He’ll have some turnout time now, too, which he very much needs. We’ll be able to follow his travels to make sure things go well for him. 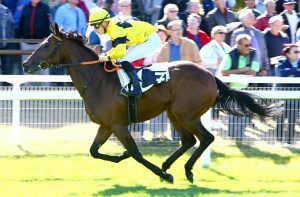 Magical Flower, meanwhile, will go to Clairefontaine on Monday for her first handicap and her first try stretching out to 2,900 meters. She seems in fine form, so if she gets the distance, and I think she will, we should have every chance here. 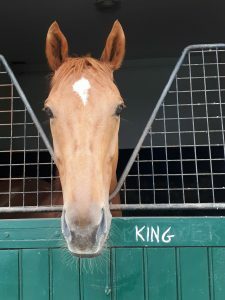 King Driver is still on track for his debut on Thursday in Deauville. He’ll have a gallop tomorrow morning and then it’s time to start declare. We’ve been this far once before without quite making it, but I’m hoping this time we can really go ahead. It all started with a f*cking flu shot. A day later, Triple Tonic started coughing. No big deal, we thought; she’s a two-year-old having a bit of a reaction. A little vitamin C, slow down for a few days and it will all be fine. But she didn’t get better. After about two weeks of intermittent coughing, in a completely unrelated incident, she decided to unhook her metal water bucket with her head, necessitating five stitches (and a change to a plastic bucket). Fine. She had to have antibiotics for this, so maybe we kill two birds with one stone and clear up the cough. One week and seven injections later, her head was perfectly healed, but she was still coughing, and the stuff coming out of her nose was not pretty. A sample was sent off to the lab, the vet was sure he had the right antibiotic and we started again. Ten days later, no change. Off to the clinic for a scope and possibly a head x-ray to make sure it wasn’t in her sinuses. Bad scope, but clean sinuses, another lab test and a third kind of antibiotic. No luck, but poor Tonic was starting to feel like a pin cushion. Meanwhile, despite doing our best to keep her isolated and disinfect everything that came in contact with her, King next door started coughing, and Rue B down the line thought she might join in. We put all the horses on a course of a broad spectrum antibiotic to try to contain things. I have never, ever done this because I hate to compromise the immune system and contribute to the development of resistant strains of crap. But this time it seemed called for. Triple Tonic, meanwhile, will move to the country tomorrow for an old-fashioned, unpleasant but effective treatment: The “abces de fixation,” a provoked abscess in the chest cavity that draws all the nasty stuff into it and is then drained. It’s akin to leeches, and for me it is definitely a method of last resort. But pumping more chemicals into this poor filly’s system just seems the wrong way to go. King obviously is a scratch for his debut tomorrow; we’ve given him a second dose of Iodure, an IV iodine designed to clean out the respiratory system. He will be rescoped on Thursday, when we’ll send swabs to the lab. So far, it looks like we might catch him before it’s too far gone. He’s also more advanced in his work, and might have a stronger immune system. Let’s hope. Rue B, too, seems to be fighting it off. For now, all the horses that have raced seem fine. They are tougher and older, so they might not come down with…whatever it is this is. I’m a bit behind on blogging; spent the week with some sort of gastro thing (I’ll spare you the details) and packing what was left of the Irish contingent off on their way home. Deauville went as expected; Shinko ran like a horse who needs a break, so he’s getting one, and then he will join Regis Reveillere in the Mayenne. Regis is a permit holder and a breeder, who just happens to be the breeder of King Driver. The change of scenery will do Shinko good, and I wish Regis the best of luck with him. George, too, will move on to other things, but not before debuting my assistant Agata in an amateur rider race on Sunday in Evreux. Birs stays on the team. He’s a big baby who is just getting started, and I’m sure he will improve with a bit of distance and experience. That leaves us with a yard of nine at the moment. Six of the Irish horses have gone back for the fall/winter. We ran a very intense, but successful, four-month campaign with them. Rendition is back for another try, so we’re pretty heavy on three-year-old fillies at the moment, with five of them. Good thing they don’t all run the same distance. The event of the week is the debut, finally, of King Driver on Wednesday at St. Cloud. He was bought at the yearling sales at Lion d’Angers last year and is a stunning horse, but will probably be better at three than two. Still, it’s time he gets a taste of what it’s all about. He’s still a colt, and he’s getting a bit bossy, so the experience of a race might settle him a bit. After that, it’s George at Evreux on Sunday, possibly along with Rue B, who worked well out of the gates on Friday and seems just about ready to try something. I’ll decide whether to run her on Wednesday.